There's a lot of confusion around the concept of thresholds in endurance sports and triathlon. In this episode, you'll get a clear and concise explanation that will help you understand thresholds once and for all. What are the aerobic and anaerobic thresholds from the perspective of a lactate test? How do these thresholds affect training and racing? You do the test in a lab where blood samples are taken during a specific test-protocol, and the lactate concentration is determined from the samples. You’ll be running or cycling, usually on a treadmill, indoor trainer or ergometer. At constant intervals, there is an increase in intensity (ramp test), and a new blood sample is drawn. This is the amount of carbon dioxide produced in the body compared to the rate of oxygen inhaled. This is called the respiratory exchange ratio (RER). You use a spiro-ergometry system to do this. You’ll be running or cycling in a lab as above, but you’ll be breathing through a valve, so that your rate of CO2 production and oxygen inhalation can be measured. The aerobic threshold measured in a blood lactate test is the same as the ventilatory threshold I measured in an RER (respiratory exchange ratio) test. The lactate threshold or anaerobic threshold is the same as the ventilatory threshold II. This is also roughly the same as the functional threshold. Other terms, like the onset of blood lactate accumulation (OBLA) and maximum lactate steady state (MLSS) are essentially the same as the anaerobic threshold. One thing to keep in mind is that you will see a lot of confusion about and incorrect usage of these terms on forums, blogs, and even magazine articles. Some people will talk about just "the threshold", or call the "aerobic threshold" the "lactate threshold". This is incorrect, because the lactate threshold is typically defined as being the same as the anaerobic threshold. Make sure that you understand the two types of threshold, so you can deduce which threshold people are talking about from the context of that discussion. Another term to define is FATmax. This is the range of exercise intensity where your fat oxidation is at its highest. It’s not a super low intensity but not a very high intensity either. Recent research shows that FATmax correlates very well with the aerobic threshold. In the study referenced, the centre of the FATmax zone was at 47.5% of VO2 max. The aerobic threshold was at 46% of VO2max. In other words, very close. Aerobic Threshold = Ventilatory Threshold I. This threshold is roughly ​​your 3-hour race intensity (in a single sport, like a marathon or a road cycling race). These systems produce energy that makes our muscles contract. This is what moves us forward when swimming, biking, and running. The muscle cells use ATP for fuel. So, all energy systems need to produce ATP as an end product. The amount of ATP stored in the muscles is enough for just a few seconds worth of work. For anything longer than that we need to use one of three main energy systems. This system uses creatine phosphate to produce additional ATP (adenosine triphosphate). This is an anaerobic system. It does not need oxygen to turn creatine phosphate into ATP. It’s the dominant energy system for events like the 100-meter dash wherein the energy requirements are around 10 seconds or less. It contributes for events lasting up to 30-45 seconds. This system breaks down glucose into ATP through an intermediate product called pyruvate. Pyruvate can be used to either generate energy anaerobically, or be used by the mitochondria in the cells to create energy aerobically. In the glycolysis case, pyruvate is used anaerobically to create energy. Within this process, lactate, and lactic acid and hydrogen ions are produced. ATP is formed in this process. The hydrogen ions are by-products that will start to lower blood PH if not cleared. This is called acidosis. This is the reason you start to feel the burn when you start to accumulate hydrogen. This is also the onset of declining performance. The glycolysis energy system is dominant between 30 seconds to 2 minutes. It contributes significantly in events up to 10 minutes. However, there is always some contribution from this energy system in triathlon. This system uses oxygen to convert pyruvate to ATP aerobically in the mitochondria in the cells, rather than the pyruvate being converted to lactate. Comparing these energy systems, one glucose molecule can produce 2 ATP molecules in glycolysis, anaerob​ically. In aerobic oxidation, one glucose molecule can produce 32 ATP molecules. This requires sufficient oxygen available to convert pyruvate aerobically in the mitochondria. Otherwise, the pyruvate will go into the anaerobic energy system. The aerobic oxidation is slower than glycolysis but it is the dominant energy system for events lasting longer than 5 minutes (like triathlon). However, there is always more than one energy system that is used at the same time in exercise and in racing. The proportion of contribution of the different energy systems vary based on the relative exercise intensity and duration. For example, if you go out on a group ride and you are riding in the pack, you’re not really exerting yourself too much. Your aerobic system does the majority of the work although there is a small contribution from the anaerobic energy system. Then you get to a hill, somebody decides to make an attack and you try to stick with it. Suddenly, you’re riding at a very hard intensity. 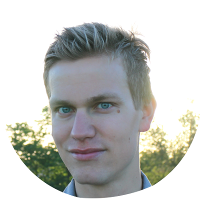 Now your anaerobic energy system or glycolysis becomes a larger contributor of energy. For a while, when producing your peak powers transitioning into the attack, you may even have a large contribution of the ATP-PC system. If you measure your threshold using blood lactate samples, you will get a chart that plots your blood lactate concentration against the intensity of power or speed. Let’s say you’re running on a treadmill. You’ll start at a very low intensity and maybe run for 3 minutes. Then you will increase the speed slightly. Every time you increase the speed, a new lactate sample is drawn. The researcher then measures and analyses the lactate concentration in your blood for each intensity point. When you conduct a lactate test from a sufficiently low level of intensity, lactate will remain at a relatively low baseline similar to at rest or even lower than the resting value. At increasing work intensities, it will still remain at the baseline until at a certain point when it begins to rise. This is generally defined as the aerobic threshold. It can be seen as a point when the contribution from your anaerobic energy system becomes larger. To learn more about this, check out this article by Alan Couzens. The anaerobic threshold, on the other hand, indicates a point of exercise in which lactate dissipation and clearance can no longer match the rate of accumulation. This is where you start to see an exponential increase in lactate. Increasing intensity beyond this point means that any further contribution of energy comes from the anaerobic energy system. Your aerobic energy contribution is maxed out. On the lactate curve, you’ll see this as the point when the actual curve breaks away from a straight line from the aerobic threshold points. Comparing this with an FTP test, you can measure your anaerobic threshold by doing a 20-minute all-out test. You take 95% of the intensity that you hold for that test to approximate your anaerobic threshold. 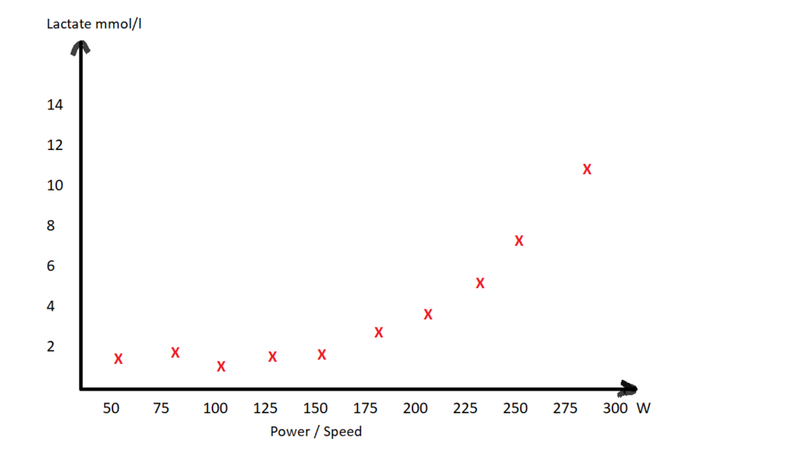 This is generally a reasonable approximation for what intensity you could hold in a race for an hour. This is termed your functional threshold. However, there is quite big individual variance in if you can actually hold functional threshold intensity for an hour or not. In a respiratory exchange ratio test, the anaerobic threshold is the point when CO2 produced exceeds the oxygen used. Aerobic Threshold = The point where your anaerobic energy system starts to contribute a bit more to your total energy production. Aerobic energy production is still very dominant. 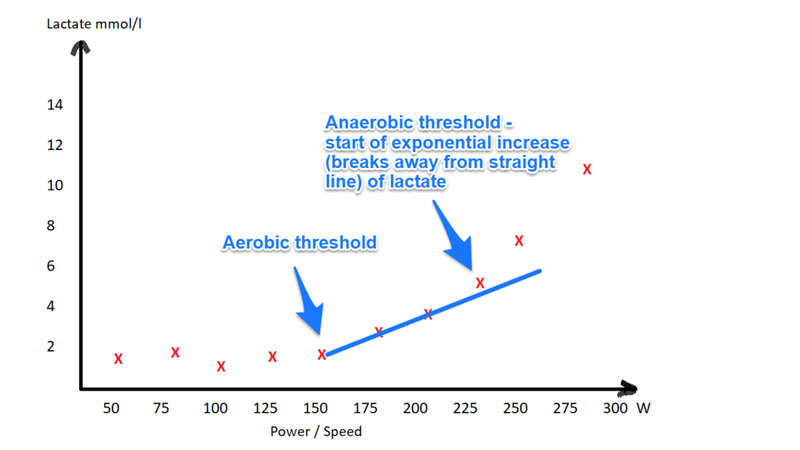 Anaerobic threshold = The point at which your lactate clearance can no longer keep up with accumulation. Both aerobic and anaerobic energy systems do work at this point, and beyond this point. But all additional energy production beyond this point is anaerobic in nature. ​Training around the aerobic threshold is meant to improve your capacity to produce a steady output ov​er a longer duration of time. It is an intensity that you can use in a marathon if you’re relatively well-trained, for example. For a well-trained triathlete, even an Ironman can be raced close to the aerobic threshold (although you couldn't do a 10-hour pure running race at your aaerobic threshold). This is a very important threshold in long-distance racing. As a rule of thumb for most age groupers, you don’t want to go above your aerobic threshold because this will quickly start to use up your glycogen stores. Remember that when you create ATP aerobically, you get 32 ATP molecules per glucose molecule used. But, when this switches to anaerobic energy production, you only get 2 ATP molecules per glucose molecule. Since your glycogen stores (which can be turned to glucose) are limited, you might become glycogen depleted if you get too much of your energy from the anaerobic energy system . If you stay around the aerobic threshold, you also use a maximum amount of fat as fuel. This is something that spares you from depleting your glycogen stores. If you focus on half or full distance triathlons, what you want to do is maximize your speed and power output at your aerobic threshold. You can do this in two ways. Option one is to "push" the aerobic threshold with high volume of work at or slightly below the aerobic threshold. Option two is to "drag" your threshold further to the right on the lactate curve by elevating your VO2max as high as possible, hoping that the points below the VO2max will fall into line. This method may work, but for a limited time only of around 8-12 weeks. Then you’ll start to plateau. So, a larger amount of training volume at or slightly below the aerobic threshold is the best long-term approach. There is no substitute for years of consistent training when it comes to developing your aerobic threshold. On the other hand, there is some evidence to say that staying too far below the aerobic threshold won’t develop it at all. There are of course other benefits of these easier workouts for recovery, etc. but not for developing the aerobic threshold. If you want to develop your aerobic threshold but you go too easy, this is where we start talking about junk miles. In terms of racing, for well-trained triathletes, the aerobic threshold is a decent estimate for Ironman race pace. Novice triathletes should make sure to have some margin for error and stay well below that. ​This is important for both long and short-course athletes. Sprint and Olympic distance athletes will race at or close to or even above the anaerobic threshold. They want to maximize their speed or power at this threshold rather than at the aerobic threshold. At the Olympic distance, beginners will still be around the aerobic threshold and not the anaerobic threshold. Knowing your anaerobic threshold is very useful in training and racing as it sets an upper cap on the intensity level at which you accumulate a significant amount of work. If you go beyond the anaerobic threshold, you will not be able to accumulate a lot of work at a high intensity. In training, what you want to do is maximize work accumulation around the physiological intensity zone that you want to develop. If you can accumulate a lot of work at a specific intensity, it has knock-on effects on the training adaptations that you get. So rather than staying slightly above the anaerobic threshold and making it through maybe 3 reps of your threshold interval workout, if you just stay slightly below threshold and do 5 reps, you’ve done really well and you’ve got some really good training adaptations through that. Doing work around the anaerobic threshold either continuously or as intervals, making sure that you maximize your work accumulation, seems to work for developing this threshold. The reason why the anaerobic threshold is also important for-long course athletes is that when your aerobic threshold converges towards your anaerobic threshold, the only way to improve further is to raise your anaerobic threshold so that you will have room to raise your aerobic threshold. Keep in mind that for long course athletes, the aerobic threshold is the primary limiter and the anaerobic threshold is the secondary limiter, when comparing these two aspects of fitness. 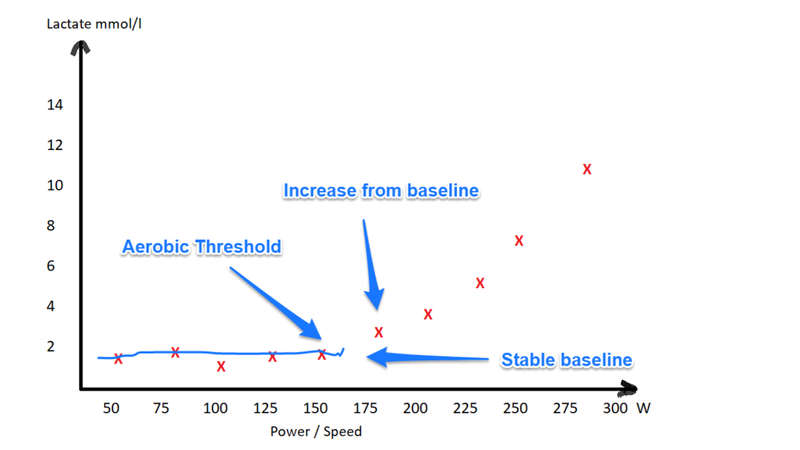 Aerobic Threshold = The primary limiter for half or full distance triathletes. Develop your aerobic threshold by accumulating training volume at or around the aerobic threshold. Anaerobic threshold = Around race intensity for sprint and Olympic distance races. Also, it can place a cap on how far you can grow your aerobic threshold. Develop your anaerobic threshold by accumulating work at or just below this intensity by doing interval workouts or continuous workouts. Although the FTP-test and other field tests (like the CSS-test and the 20-minute run test) I described in Episode 27 for swimming, Episode 29 for cycling, and Episode 30 for running are really good, there is a fair bit of individual difference in how well they approximate your anaerobic threshold. For most athletes, their anaerobic threshold may be very close to their FTP. But there are athletes on both sides of the bell curve for whom there is a mismatch in prescribing training zones based on those field tests which may lead to a loss of the purpose of those training zones. Another issue with field tests is that you may use them to approximate your anaerobic threshold quite accurately, but can you use them to estimate your aerobic threshold? There's also big individual differences in where the aerobic threshold is in relation to the anaerobic threshold. There's no fixed percentage point. This is where a lactate test or a respiratory test will show you both of those thresholds. It’s not always super clear but at least it’s clearer. Does the aerobic threshold correlate with the maximal fat oxidation rate in short stage treadmill tests? - Research study by Peric et al.